This album is about just starting out. It tells a story about a wayward youth — remotely like me, I suppose — who meets “the cutest thing that God has yet conceived,” and her love transforms him into an actual human being. Most of the 11 songs are saucy rockers … but I think it’s the ballads (cuts 4 and 10), agonizing over the need for love and a novice’s fear of it, that are my favorites in this collection. Press the album cover photo, or see below, to listen or purchase. Big thanks to producer/musician Bradford “Lefty” Dawson, and Zen-ful producer/recording artist, Ken “Green Man” Eros. Love and big wimps to former band mates Mark Whitten, Gary Pepper, and Mark Horn. “I Got Plans” is dedicated to the memory of Frederick Coffin (he wrote the infectious “Aggravated Uphill Climb”), Robin Welch (who co-wrote “Drunk Enough” and “The Great Divide”), and Gilda Radner (whose legacy lives on). I miss you. This CD is as gritty, witty and satisfying as his first CD “Boomertown” and just as ironically honest. His voice is clear and compelling and has just the right amount of soul. If you were ever young and wayward, or still are, this CD is for you. First things first. I hand out 5 star ratings very frugally. 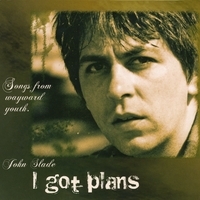 John Slade’s CD “I Got Plans” is a Rock Musical masterpiece. It incorporates many moods, expectations, and emotions that one would expect from an aspiring 20 something artist, but from the standpoint of a mature musician. The instrumentation, arrangements, and vocal approach vary from song to song according to the story that John is portraying. Ballads and good old fashioned rockers are here…songs about life and times and people. A great listen in the car or cranked up on the boom box while working in the backyard. As any good record it gets better with repeated listens. I only wish that it was twice as long !